Your Outlook.com account might be temporarily blocked because we noticed some unusual sign-in activity. We know that having your account blocked is frustrating, but we also want to protect you from fraud or abuse. Here's how to unblock your account. Go to https://account.live.com/ResetPassword.aspx to recover your account and reset your password. Enter the email address of your blocked account and enter the characters you see on your screen and select Next. Enter the code generated by your authenticator app or select Use a different verification option to get a text message. You don't need a smartphone to receive a security code. Text messages may come from either "MSFT", a short number, or a mobile number. If you have requested a security code, you can trust the message that arrives. If you don't have an alternate phone number or email address or you can't get to it, select I didn’t get a code when you’re prompted for a code at sign-in or I don’t have access to these when you’re resetting your password and then follow the instructions. After you enter the security code, you'll need to change your password to complete the unblocking process. Make sure you create a strong, unique password to help keep your account secure. Use capital letters, numbers, and symbols in your password, and try not to use the same password for different accounts. 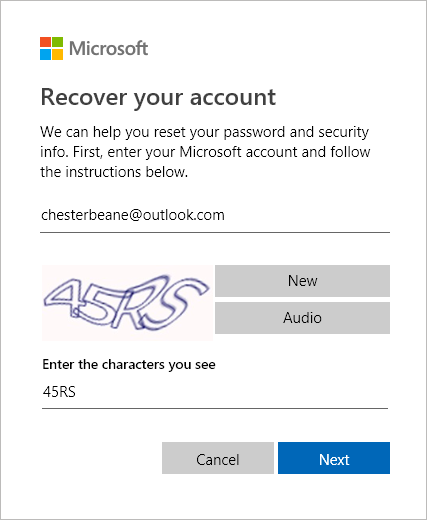 For more tips about how to make your password secure, see Help protect your Outlook.com email account. If you still can't unblock your account by entering the security code or changing your password, go to When you can't sign in to your Microsoft account. Note: This article will help you reset your password, guide you if your password reset doesn't work, and there's a link to contact support. Get the Microsoft Authenticator app on your phone, for free.